No other country mixes European cultures and languages quite as well as Switzerland, so for parents wishing to give their children invaluable linguistic skills and an appreciation of multiculturalism, there really is no better place to send them to than an international summer school. It’s not always easy to fit extra language studies into the normal term times of most schools, which is why a summer programme is the ideal opportunity to combine fun, stimulating activities like water sports on Lake Geneva, other sports and various excursions, with classroom studies in French or English and immersive cultural experiences. 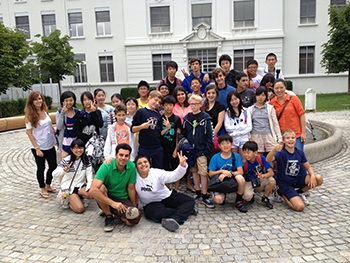 Brillantmont in Lausanne is an international school in the truest sense, with students attending from around 30 different countries. As such, our hugely popular Summer Course is culturally diverse, but with all students united by a drive to live life to the fullest and improve their English and French. Girls and boys aged 10-16 attending the Summer Course typically choose to stay anywhere between two and six weeks. Weekday mornings are spent in class, learning French or English, with sports in the afternoon. Evening activities and our busy weekend excursion programmes are designed to stimulate young minds and encourage our students to practice their languages in real life situations, adding extra depth to their academic pursuits. Registration for the Brillantmont Summer language programme 2014 is now open, with places being snapped up. Click below to visit our Summer Course page and request our information pack, which includes further details on how to enrol with all the appropriate forms.